BACKGROUND: The use of alcohol and other drugs (AODs) in the workplace has a major impact on the health and productivity of the workforce globally. Yet information on this issue is limited in South Africa (SA). OBJECTIVE: To describe the nature and extent of AOD problems in selected workplace settings in SA. METHODS: Secondary data analysis was conducted on a large dataset compiled by an Employee Assistance Programme (EAP) service provider in SA. As part of an EAP risk audit, assessments for AOD-related problems were completed for each employee accessing EAP services (n=10 428) between 2005 and 2011. Data on the socio-demographic profiles, AOD use and impact of AOD use on the work performance of employees were analysed. RESULTS: Findings indicate that employed men are more likely to experience alcohol-related problems than women, the latter demonstrating a higher percentage of drug-related problems. The majority of referrals to the EAPs emanate from the public, industrial and financial sectors. AOD-related problems were also found to significantly impact on employee work performance. CONCLUSIONS: The study begins to address the knowledge gap on the extent of AOD use in SA workplaces and points to the need for further investigations into the exact nature of AOD use. In addition, the study highlights the need for intervention programmes and policies suited to the workplace. The harmful use of alcohol and other drugs (AOD) remains widespread among people of all ages and socioeconomic groups. AOD abuse is a major cause of mortality and is a risk factor for non-communicable diseases. The 2010 analysis of 67 risk factors and risk factor clusters for death and disability found that alcohol was the fifth leading risk factor for death and disability globally, accounting for 5.5% of disability adjusted life years lost - up from eighth position in 1990. Problematic AOD use by employed people potentially has negative implications for their health since untreated and undertreated health problems, including harmful AOD use, exact substantial costs from individuals and their employers. Accurate prevalence data on the nature and extent of AOD use among employed people is necessary to help guide organisations in the implementation of effective AOD policies and the planning of interventions aimed at early identification of employees with AOD-related problems. However, few empirical research studies have focused on AOD use in the South African (SA) workplace. Available data are often out of date and are concentrated on sectors such as the mining and agricultural sectors. There is very little information on AOD use within other sectors such as the manufacturing, financial, or industrial sectors despite the fact that these sectors account for 35% of people employed in SA. To describe the nature and extent of AOD problems in selected workplace settings in SA. This was a retrospective analysis of a large national dataset on Employee Assistance Programme (EAP) service utilisation by an EAP service provider in SA. As part of an EAP risk audit, assessments for AOD-related problems were completed on each employee accessing EAP services (n=10 428) between 2005 and 2011. The EAP service provider services more than 436 organisations in SA. The EAP service provider collects AOD data when contact is made with an employee or dependent/household member who requires assistance for psychosocial issues. Data reported were collected through telephonic counselling sessions or face-to-face assessments conducted by professional counsellors at the EAP call-centre. As part of screening and general assessment processes, an employee was asked whether he/ she used AODs to cope with problems. The EAP service provider collected biographical, AOD use and other behavioural risk data using an assessment tool designed to assess the prevalence of a wide range of behavioural risks within the working environment. 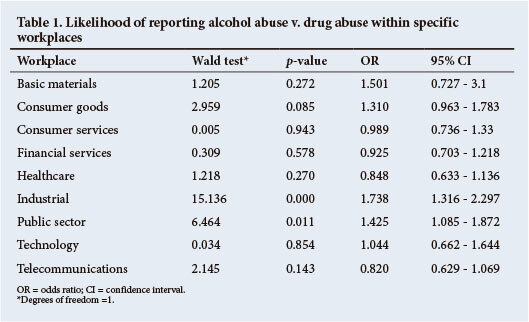 Multinomial and ordinal regressions were conducted to determine significant workplace differences between those who reported alcohol abuse and those who reported drug abuse, and to establish associations between AOD and impact on work performance. Ethical approval for the study was obtained from the Research Ethics Committee of the South African Medical Research Council. From a total sample of 398 768 employees seeking EAP assistance for generic psychosocial problems, 10 284 employees (2.6%) were identified as having an AOD-related problem. Of these, 57.8% were male. The main sources of referrals to the EAP for AOD-related problems were self (72%) and employee managers (15.2%), a further 6.9% were referred by their human resource departments, unions or family members. The majority of clients were general employees (87.1%) while 12.9% were at management level. The employment period ranged from <1 year to >10 years. Up to 29.1% of clients had been employed at the same company for 2 - 5 years, 16.6% for 5 - 10 years and 27.7% were employed for >10 years. Two-thirds (65.4%) reported an alcohol-related problem, while 34.6% reported a drug-related problem. Although alcohol use was common for both men (72.2%) and women (56%), men were more likely to report alcohol-related problems compared with women (χ2=292.2, degrees of freedom (df) =1); p=0.000). Women were significantly more likely to report drug-related problems (44%) compared with men (37.8%) (χ2=292.23, df=1; p=0.000). In relation to age, employees within the age range 22 - 30 years were more likely to seek assistance for drug-related problems (33.5%) as opposed to alcohol-related problems (30.4%). Employees between the ages of 31 - 40 years were more likely to seek assistance for alcohol-related problems (34.8%). When combining AOD data, employed persons aged 22 - 30 years (31.5%) were more likely to report AOD use than employees within other age groups. AOD-related problems were most prevalent among employees who had been employed for 2 - 5 years (alcohol 23%, drugs 19.3%), followed by those who had been employed for >10 years (alcohol 21.7%, drugs 18.8%). Clients reporting AOD use were employed within the public services sector (29.5%), the financial sector (21.9%), the industrial sector (21.1%), the health sector (9%) and within consumer services (8.2%). Comparing the extent to which AOD abuse was present in specific workplaces, suggests that clients in the public sector were significantly more likely to seek EAP assistance for alcohol-related problems than drug related problems (odds ratio (OR) 1.43, 95% confidence interval (CI) 1.08 -1.87). Similarly, within the industrial sector employees were almost twice more likely to report alcohol-related problems than drug-related problems (OR 1.74, 95% CI 1.32 -2.29) (Table 1). Regression analysis shows that AOD-related problems are significant predictors of work performance. Furthermore, it was found that the more an employee abuses AOD, the greater the impact on work performance. Risky alcohol use is far more prevalent among employees than problematic drug use. This is in keeping with what is known about the prevalence of AOD use in SA. AOD abuse were almost equally distributed across male and female employees. However, our findings suggest the nature of these problems differed by gender, men being more likely to report harmful and hazardous use of alcohol than women. Multiple literature sources point to lifetime use of alcohol being higher among males than females. In contrast, women were significantly more likely to report drug-related problems than men. This finding is in sharp contrast to other studies examining gender differences in drug use. For instance, studies of specialist substance abuse treatment centres have noted that women consistently comprise only 20 - 25% of the treatment population. These findings suggest that employed women are less likely to encounter barriers to accessing drug intervention services when these services are offered in the workplace than women who attempt to access drug intervention services offered by specialist substance abuse treatment facilities and community-based social welfare services. There may be several reasons for these findings including that women find accessing EAP services less stigmatising than services labelled as drug treatment services, particularly as stigma is a major barrier for women not accessing AOD intervention services. Moreover, this study found that drinking and drug use is unevenly distributed across different workplaces (classification of workplaces is according to the Industry Classification Benchmark) and occupational groups. The public, financial and industrial sectors appear to have the highest concentration of AOD referrals, and employees within the public and industrial sectors were significantly more likely to present with alcohol-related problems than other sectors. In contrast, referrals for drug-related problems were more prevalent in the financial, consumer services and healthcare sectors. In workplaces, persistent AOD use among employees may place the organisation, its employees and other organisations within its sphere of influence at risk for harm. Findings from earlier research have identified several health and other hazards associated with AOD use within the workplace. Specifically, AOD use may compromise the cognitive and motor abilities of an employee resulting in slower reaction times, poor hand-eye coordination, increased risk-taking behaviour and reduced decision-making ability. Taken together, these findings suggest the need for routine screening for AOD-related problems for all employees referred to EAP, as this provides an opportunity for early identification, and for interventions to occur at an earlier stage of problem severity - before problems become ingrained and require intensive (and costly) interventions. This survey's findings should be interpreted in the context of certain limitations. Firstly, the dataset used in this study provided no information on the types of drugs used. Future studies should focus on examining the patterns of AOD use since accurate information about workers' drinking or drug use patterns is essential for the development of appropriate and effective policy and intervention strategies. Secondly, the findings from this study cannot be generalised to workplaces or sectors where the service provider does not operate. Despite its limitations, this study highlights the need for further investigations into the exact nature of AOD use and the identification of industry-specific risk factors for AOD use. This study also advocates for the implementation of early identification through routine screening and the implementation of evidence-based prevention programmes designed for the workplace. Conflict of interest. The secondary dataset used in this study is the property of ICAS, an EAP provider. Any opinion, findings, conclusions or recommendations expressed are views of the authors. Author contributions. NHB contributed to the conceptualisation and writing of the manuscript and analysed the data. SD contributed to data analysis and the writing of the manuscript. BL, BM and CP contributed to the writing and review of the manuscript.